Faro lies at the heart of the Formosa Estuary, the city is surrounded by a medieval wall and offers a large number of interesting monuments such as the 13th century Cathedral and the 18th century Episcopal palace. Another interesting building to visit is the 16th century Convent which nowadays houses the city's archaeological museum and also you must not miss the "golden" church of Nossa Senhora do Carmo. You also have the Naval Museum located next to the boat basin bordering the Praia de Dom Francisco Gomes. Capital of the Algarve since 1756, the construction of Faro airport on the outskirts of the city in 1965 made this region a hub for tourist traffic across the region. Apart from its rich artistic heritage Faro also offers all the necessary infrastructures for tourism like hotels, restaurants and other facilities, such as car hire Faro, tours and day trips, not to mention the many attractions offered by the surrounding area, from the long beaches of Faro at just 7 kms from the city to Estoi and to the important Romans ruins at Milreu. Another interesting site is the Ria Formosa lagoon, a nature reserve of more than 17 000 hectares, where many different migratory birds stop in spring and autumn. There are many accomodation places where you can enjoy the comforts of classic and traditional hotels in Faro Algarve, but with all modern comforts. As in other popular tourist destinations, it is much better to reserve your hotel ahead of time, especially if visiting Faro in summer. Price for a night is usually much expensiver in high season than in low season, so if you are looking for low budget or economic hotels, we highly recommend you to choose another month for coming, and evade the summer months and September. El Faro Hotel, 4 stars, is perhaps one of the most popular in the area, and a place alongside the historic shops of the village. Hotel Residencial Sun is also situated in a privileged area, near the monastery of the Capuchins, and leaves us at a good place from where to go to the beach or start a sightseeing tour. Quinta do Lago hotel is an ideal place if you want to practice all kinds of activities, both aquatic and traditional, such as golf. It is located in the middle of a large expanse of pine trees and hills and golden sand beaches to enjoy. 5 Stars hotel, its price may be expensive but it is one of the most famous and prestigious in Algarve and you will not be dissapointed. Santa Maria Hotel is a more affordable option without sacrificing quality. It is situated in a good area of Faro, where we can get to almost every place for our tourist trips. Alfonso III Residence is another alternative for our accomodation in Faro; sophisticated and classic decor with a modern equipment. The Portuguese Algarve area is known for its beautiful beaches and nature. The regional capital, Faro, is the home of the Ria Formosa lagoon, a nature reserve of over 170 square kilometers and a place for strolls in the evening. Use not to be hard to find cheap airline tickets to Faro, and the accommodation is quite economically, the better approach to Faro is in the low season; In spring and summer season, the weather is extremely hot and also is croweded of tourists coming from all European countries attracted by the beauty of the city. One recommendation: the cost of taxi from Faro airport to Faro town is not excessive, so if you do not want to wait for the bus(due to irregular schedules), or you are not looking for a car rental at Faro airport (an option we recommend), is much better to opt for the transfers from Faro airport. Once in the city, it is advisable not to go that fast to the beach (located 7 kms from the city), we know you want to experience the beaches of Faro, but it is also advisable to stay in the city center and to enjoy the aroma of its people and its streets, having a good seafood or enjoying the traditional meats and fowl. The many bars in the vicinity of the marina are a good option for both day and night. However, they are aimed at the tourist and are much more expensive (and worse) than if we go walking through the streets. They are, accordingly, a not too expensive option. Fresh fish is superb and a good example for this is the Cataplana, the dish of the region, a base consisting of different kinds of fresh fish and seafood. You will like the tranquility and friendliness of the Algarve people. The kindness of the employees of the Tourist Office will surely surprise you. Thanks to this institution, you can get all the information you need about Faro, Algarve and even Portugal. An example to be followed by other European cities. Faro travel means visiting the streets, not just the Ria Formosa, but the marina and the historic Old City. Occupied by the Romans and the Visigoths, in the fifteenth century was a prosperous city with a large and active Jewish population. Finally, the nightlife in Faro, is situated mostly on Rua do Prior and encouraged by all the business around with bars and clubs that open almost every day, intensified by the university environment. Dux, house music, Disco, or ultra-formal and the bar Galeria Patrimonio, enjoy wide popularity. Faro's cuisine goes back to historical times (Roman and Arabic), and is, together with the climate of the region, one of the major attractions of the Algarve. The fresh ingredients reflect the taste of the sea and the pleasant aroma and the strong field. From the famous "Rice Lingueirão" to the candy "Don Rodrigo." In Faro there are restaurants for all tastes and all pockets. Below you can browse more information about Faro and the surroundings. Explore and enjoy Faro! 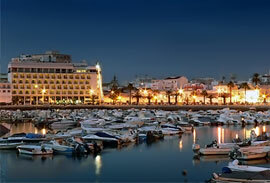 What to do in Faro: Attractions, monuments, museums and information for your visit. Faro weather and climate: Get information about Faro weather and climate. Nightclubs in Faro nightlife: Experience the night in Faro. Faro airport: Faro airport arrivals, departures, transfers, services and information. Rent a car in Faro: Faro car rental resources and information.